With a full head of brunette hair, Ella Louise Smith came into the world at 4:03am on Tuesday, June 2nd, 2009, taking full advantage of the fact that she was almost a full pound lighter than her older brother at birth to make for a much more pleasant delivery experience for her mother (and, in turn, her father). As soon as we had the opportunity, we thanked her for her kind consideration. See the video of Isaac meeting Ella for the first time! She weighed 8 lbs, 2.4 oz and measured a leggy 20″ long. Within seconds, she let us know (in shrill tones) just what sort of injustice this cold, bright, loud new world had rendered. Our experience at the Birth Day Place at Feather River Hospital was exceptional. The facility itself was large, clean, and well laid out to evoke a feeling of spacious health (the opposite of most hospitals). The nursing staff was friendly, caring, and professional, as well as very capable and knowledgeable. Even the food was great! When was the last time you heard of a hospital with delectable dishes? Going into this labor, we were very concerned about Tina’s hip/pelvis/nerve injury (a leftover from Isaac’s delivery in December, 2006). Isaac’s was a very difficult birth, with a great deal of pain associated with walking (or even moving) due to nerve injuries from complications during delivery in 2006. As luck (or God, or destiny) would have it, Ella’s birth was a much less harrowing process that didn’t cause (or aggravate) Tina’s injuries from Isaac’s birth. Afterward, the nerve pain that had been afflicting Tina throughout Ella’s pregnancy had subsided significantly and she was able to walk and move about as expected after a normal delivery. Needless to say, we both breathed a huge sigh of relief and were thankful for the wonderfully contrasting positive delivery experience. 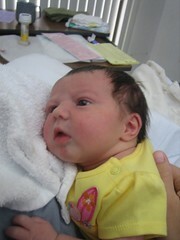 We were discharged yesterday afternoon (June 3rd) and came home to get to know Ella a little bit better. She and Tina are doing very well and we’re all moving gracefully into the newborn routine. Big brother Isaac is enchanted with his new “cute baby mister” (he can’t quite say “sister” just yet) and constantly wants to hold her. What a Blessing and what Joy! Ella is BEAUTIFUL just like her big brother Isaac!! We so look forward to meeting her. Ella is a treasured gift to our growing family….Life is Wonderful!! She’s beautiful! So glad the birth went well-great job, Tina (and Tyler!:>)! Thank you for including me in your email. Can’t wait to see her in person! Congratulations Smith clan! What adorable pictures and video. I’m so glad Ella’s arrival went well for everyone and Isaac is enthralled with his “mister”. We’re coming thorough Chico in early July – maybe we could pop by for a quick visit? Tyler & Tina, Isaac and Ella! Congratulatons!! Great job, Tina! Whew! I have thought about you! You have a beautiful family and we enjoy the pics that come along! Enjoy! The hard work will pay off!!! What a great name, Ella, there is a French song written for Ella.